My grandfather lost his mother when he was 3 years old. His older sister Clara cared for him and he thought of her as a mother. In 1918, the influenza pandemic infected 1/3 of the world's population and Clara was one of the casualties. She became ill in December. My grandfather remembered watching over his older sister as his brother hitched up the horses to the sled. The snow was blowing as his brother flew down the road to get the doctor. Clara was so ill and there was no time to loose. The doctor and brother arrived back at the farm, only to find they had arrived too late. My grandfather told me the story over and over. The grief of this event seemed always fresh as he shared his story with me. 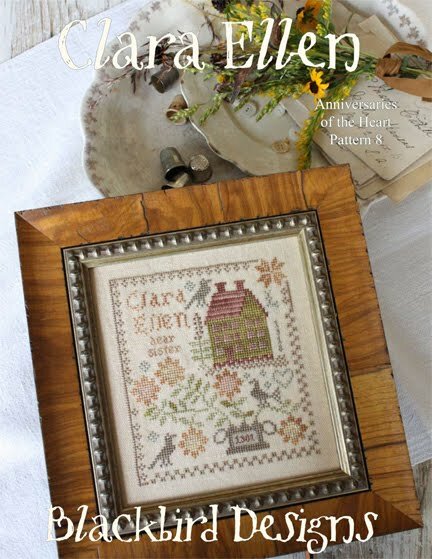 This new "Anniversaries of the Heart" sampler remembers Clara Ellen. During my last visit to Polk, Nebraska, I cleaned around my grandparents marker at the cemetery and I noticed Clara's gravesite. As I looked at her marker, I realized I hadn't known her middle name was Ellen. While rubbing the grass away from her stone, I knew she was the one I wanted to remember on my next sampler. She was only17 when she died...and I didn't want her memory forgotten. My grandfather is buried next to his wife and sister in a small prairie cemetery in Nebraska. The tall grass waves in the wind over them as they remain close together. I'm taking this pattern to the printer today. It should be in your local shop in about 2 1/2 weeks. I'm back to the sewing machine! Have to finish my quilt. Take a moment and visit this site. What a group this is! What a sad story. And this is a beautiful sampler to remember her by. That story broke my heart today. It's been one of those days having just this past year lost my father whose birthday is coming up on the sixth. Your sampler is such a beauty and what a wonderful way to honor her memory. It is wonderful knowing the story behind a design. I can't wait to stitch it! What an amazing and sad story! Even more touching as I am from Nebraska, too, and had an Aunt Clara. You did your family proud, and I can't wait to purchase the pattern. Love the new designs! It is so pretty and such a sweet remembrance of the loved one. I will say it again, you two are amazing! I love everything you do. Although the history of Clara Ellen is a short sad one, your grandfather's story to you has given her life through the generations. Your tribute to her is amazing and beautiful. I am sure they both are smiling down on you. What a beautiful sampler and a sad story. What a beautiful, sad story. I just love the design you've made to remember Clara Ellen. Wonderful! Such a poignant story rich in family history. A beautiful way for Clara Ellen to have been remembered. What a beautiful sampler to remember Clara Ellen! What a wonderful tribute. Oh Alma, that is beautiful. Thank you. I'm so looking forward to seeing you at the Shepherd's Bush Retreat in a few weeks! That is the sweetest story and I will get this pattern when it comes out and do it just in memory of your Grandfathers sweet sister, Clara Ellen, Lovely story. Another great design! Thanks for sharing the story behind it. What a sad story and a beautiful cross stitch to remember her by. I love your work and fabrics. A beautiful tribute to Clara Ellen. What a heart breaking story! I have lost a sister and a brother and the grief is heavy. Bless you for this wonderful tribute to her and your grandfather. I know I have to have this piece now. I love your designs. I'll be watching for it. Oh, such a sad story but wonderful that you are memorializing her this way. Alma...I can't find your patterns locally. I will have to search online for a store that sells them. This is one I'd love to have. Clara Ellen is so lovely, and thank you for sharing this story. She sounds like a special lady to remember. I have enjoyed stitching this series so much. I finished Valentine Rose just a couple of nights ago and loved every stitch! Love the sampler and what a wonderful tribute! Such a sad story. How old was your grandfather when he lost his sister? What a wonderful young woman she must have been. Thank you for honoring her. What a beautiful story, and a beautiful sampler. Thank you for sharing it with us. Time has a way of slipping thru our fingers - we must never forget the ones we love. A sad story, but a wonderful tribute in memory of Clara. That was such a moving story... and you've created a wonderful tribute to your great-aunt. I really love all thinks "blackbird". You ladies are so talented! Please enter me in the raffle for the little emery box. Wow...this story touched a chord with me.....my mom's name is Clara and her mom's middle name, and hence mine, is Ellen. A beautiful sampler amd tribute to Clara Ellen. The tears are running down my face. I hope they've found each other again. Your sampler is beautiful, Alma. What a beautiful story, it made me tear up. I can't wait to stitch it and will think of the history behind the picture. A tender story of a time that truly left few families without the loss of a loved one. It is such a fitting tribute to lovely Clara and your Grandfather. I, too, want to stitch this and remember them and my ancestors that went before me. Your anniversaries of the heart are so inspiring. Thanks for sharing your story ... Clara Ellen meant an awful lot to your grandfather it seems ... the sampler is just stunning and a beautiful tribute ... and the history adds to its beauty. My late stepdad lost his dad and four sisters in this epidemic. All that was left of his family was his mom, his older brother, and him. In this modern time, people don't understand how whole families were wiped out by this epidemic. I am glad that you are honoring Clara Ellen and in a way, honoring all of those that died in that epidemic. love this design and since the anniversary of my dad's death is this week, this is a "shiny eye" read as I am already a little weepy! Beautiful design though! Such a sad story and a beautiful sampler. I shall have to stitch this one for my Great-grandmother, another Clara Ellen. I love the piece! It's absolutely beautiful. And as someone who inherited the middle name of Ellen from generations past I will remember my own family's stories as I stitch. I look forward to meeting you in Park City at the Shepherds Bush Retreat in a couple of weeks. What a beautiful story. Generations past had to deal with early deaths from diseases, accidents, and childbirth to name a few. Siblings and family would often step in and help raise those left. Here's to all the Aunt Clara's who were there to hold the family together as best they could. Dear Alma: a sad but bitersweet story you have the gift to bring your family to life, I look forward to more of your stories. and patterns. Thank-you for mentioning our Blackbird Exchange on your blog site I have participated in everyone of the exchanges, the ladies in this exchange are so talented.